Cornflowers; so called in England where they often self-sow in cornfields, were brought to the Americas in the 17th century. Better known today as Bachelor�s Buttons, these blue beauties were worn by returning sailors to signify they were available to marry. 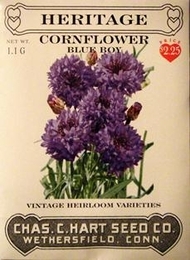 Rich blue fine petalled pom-pom flowers bloom atop two foot tall gray-green foliage. Blooms late spring to early fall. Lovely cut flower or in a wildflower mix. The cut flowers are also edible. Easy to grow annual for full sun. Sow seeds directly outdoors in late spring when soil has warmed, covering with 1/4 inches of fine soil. Thin to 6 inches apart. Removing spent flowers will encourage continuous bloom, will self-sow from year to year.